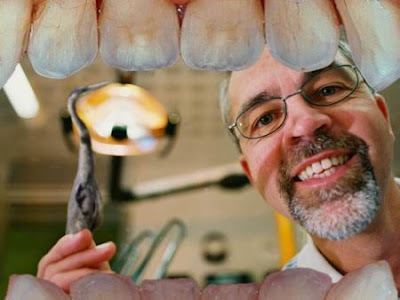 A Polish dentist "under the influence" pulls the front tooth of a patient in for a routine crown. A man in Radomskom, Poland might not be smiling for a while. After visiting the dentist for a routine crown, his "drunken" dentist pulled out his front tooth, then kicked him out and hid from police. Polskie Radio reports that the patient suspected the dentist was drunk when he polished the tooth and gave the patient five jabs of anesthetic, but the patient didn't react until it was too late. "After a few minutes, the 28-year-old saw that his front tooth had landed in the bin, and at that moment he decided to protest,” says police spokeswoman Aneta Komorowka. After the patient requested dental records, the 50-year-old dentist booted him from the surgery room, and then barricaded himself in his office. When police broke in, they confirmed that the dentist was under the influence of alcohol. Police will determine the dentist’s exact charges once medical examiners calculate the extent of the patient’s injury. Mei Schultz is a copy editor, journalist and uUndergraduate Research Assistant at Columbia University Medical Center. You can find her on Linkedin. Women Get "Tipsy" While Men Get "Hammered"